Keith Williams’ Marlowe Theatre wins RIBA Downland Award. 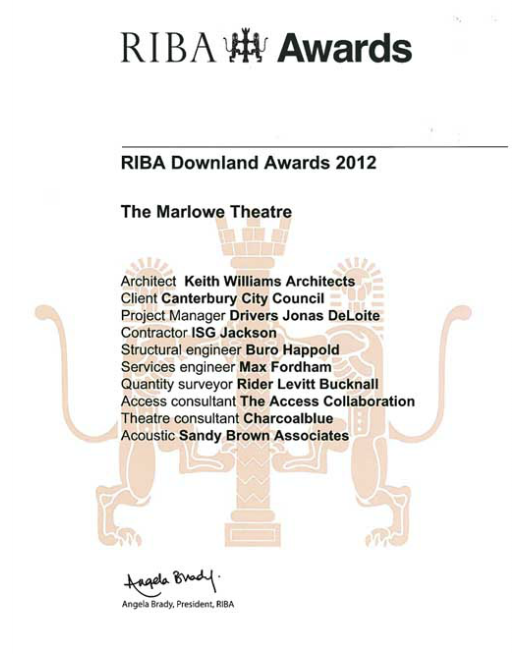 The Marlowe Theatre has been awarded the RIBA Downland Award 2012 as a recognition of its architectural excellence. The award ceremony took place in the Steam Museum in Swindon on the 2oth June at a sold out event. Keith Williams’ head of marketing, Vanessa Shrimpton along with the clients for the Marlowe Theatre, collectively Colin Carmichael CEO and Janice McGuiness of Canterbury City Council along with Mark Everett, the Marlowe Theatre’s Director and Paula Gillespie the Marlowe’s Associate Director, attended in person to receive their award. The Marlowe has quickly become the most importance performing arts venue in the south-east and is already contributing to the revitalisation of the western portion of Canterbury city centre. At a separate ceremony on the 21st June, the following day, the Marlowe Theatre was also awarded both the East Kent People’s Award and the Cultural Landscape Award (Canterbury Culture Awards) crowning an exceptional few days for both the Marlowe and Keith Williams Architects.